This is Part Three of a five-part series on the question of Russia and “fake news” by Vasily Gatov, who is a USC Annenberg Visiting Fellow. The “Russian meddling” narrative would be empty unless were it not liberally stuffed with a juicy espionage filling. While a certain level of awareness of Russian intelligence activity is necessary, it is vitally important to separate the threats from the imaginary; it is also essential to clarify some historical legends that frame the storytellers’ thinking. There is little room to doubt the high level of coordination between RT/Sputnik, Kremlin ideologues, the Russian Foreign Ministry and, possibly, Russian intelligence services. Meanwhile, the real and most important operator of the messaging is Vladimir Vladimirovich Putin himself; if not the actual man, then the a complex mythological persona that bears all views and observations he ever made publicly or privately in regard to the Putinesque worldview. 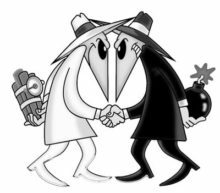 Back in the 1980s, former CIA station chief in Moscow Richard Pringle came to American academia with a brilliantly coined term: “counterintelligence state”. He was trying to explain the inner workings of the USSR’s policies under General Secretary Yuri Andropov, the ex- KGB director who succeeded Brezhnev. Under Andropov, the Soviet state became fixated on intelligence and subversion threats – every problem the Communist system faced, home and abroad, was interpreted as CIA meddling. Dissidents? The CIA funds them, instructs them and supplies them. Economic constraints? The CIA organizes them. Religious resurgence, Orthodox or Jewish? Of course, foreign intelligence – in this case, Mossad! The Soviet counterintelligence state was also highly ideological and media-phrenic. Censorship reached the heights of idiosyncrasy. In 1982, Radio Liberty headquarters was attacked by KGB-funded terrorists. Soviet intelligence developed its proficiency in “active measures” – the creation and distribution of fakes that targeted the main adversary (USA) with compromising “facts” like the artificial nature of the AIDS virus, created at Fort Derrick as a part of an (already banned) bacteriological weapons program. Russian spies penetrated the highest ranks of CIA not to find US military secrets, but to detect defectors and agents in Moscow. Putin (whether real or imaginary) is the child of Andropov’s counterintelligence state. A moderate reformer right after succeeding Boris Yeltsin, he inevitably turned back to Andropov’s megalomania as soon as the complex reality of Russian state-building in the mid-2000s necessitated more than simple superficial remodeling. For Putin in 2007 (the year of his infamous Munich conference speech) Russian grievances about Western neglect of Russian interests were tantamount to the activity of foreign spies who wanted to prevent the rebirth of powerful Russia. Guided by this – almost fully false – logic, Vladimir Putin started his new reform: now he was building Russia as a counterintelligence state a foundation of corruption and graft, which was native to his early regime. It took little time to establish “active measures” as a vital component to counterintelligence state. But the comparison should not fool us: unlike the USSR, Russia is not a treasure trove of intelligence talent (which is needed to produce powerful active measures), nor does it espouse an ideology that distinguishes friends from foes (another crucial component). Modern Russian ideology is best described as the negation of truth – as the title of Peter Pomerantsev’s book Nothing Is True and Everything is Possible sums up quite elegantly. Not that the “imaginary Putin” thinks of himself and Russia as an exemplary human and political beings or forces for good; on the contrary, they quickly admit being imperfect, even bad guys. But if Russia is “bad,” then everyone else is no better, whether we are talking about foreign policy, domestic surveillance, the suppression of the opposition, or restrictions on the free press. In every aspect, Putin’s worldview is based on some example of Western (or American) misbehavior, historical or modern. As the Russian Foreign Minister Sergei Lavrov once said: “Who the f…ck you are to lecture Russia?” in response to a British diplomat’s criticism regarding the crisis in Georgia. Armed with this obscure but simple ideology of negation, the Russian counterintelligence state developed a whole new “Service A” (the infamous KGB department that specialized in active measures). In the much less confrontational world of 2010s it took the form of a perfectly legal international media outlet– like RT or Sputnik or their various “sister publications” that funneled the messages from the Kremlin to the global information space (for the sake of brevity, I have intentionally omitted the Russian domestic side of the operation). The important question is funding: where the Soviet Union had military and political organizations to conduct active measures, modern Russia needs money. KGB intelligence relied on both ideas and money as drivers of conduct; Russia has no illusions that anyone will help its cause for free. Between 2007 and 2017, it openly spent almost 2 billion dollars on RT alone. This is just the legal tip of an extralegal iceberg; one can only guess how much cash was funneled into corrupt “agents of influence” and “useful idiots”. These are good days for the counterintelligence state: not only do we spoil adversaries’ information space, but we also corrupt their own people! Nothing makes spy hunters happier than having a copy of the paycheck of some idiot who accepted it.